Fashion and entertainment are two things that go hand in hand in the showbiz industry. Looking good is good business and most celebs always try to appear their best. Nigerian music star, David ‘Davido’ Adeleke, is one entertainer whose style fans can predict. Seeing as he is a young man, he is often spotted in hippy clothes and designer sneakers accessorised with big and chunky jewellery. However, the DMW boss has decided to switch up his style a little bit. He took to his Instagram page to share photos of himself in a suit. 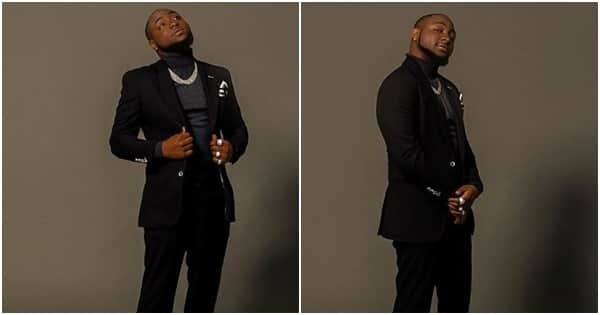 Davido looked very dapper in the suit which he paired with a grey turtle neck. His jewellery was minimal compared to his usual taste but he still had on a silver necklace as well as some rings on his fingers as well as a pair of studs in his ears. To complete the whole look, the singer exchanged his usual sneakers for well-polished black leather shoes. It goes without saying that Davido is a whole snack with this look. The singer is obviously still in a celebratory mood owing to the fact that the election tribunal declared his uncle, Ademola Adeleke, the winner of the Osun state governorship election. After the pronouncement was made, the DMW boss took to his Instagram page to rejoice with the people of Osun state.